Death is a frequent visitor at Menno Place, B.C.’s largest senior care facility. Until a couple of years ago, though, deceased residents were removed as quickly as possible on a funeral home gurney, wrapped in a nondescript covering and seen by as few people as possible. But thanks to a group of dedicated quilters, those who have recently passed now leave the facility with dignity under a butterfly quilt, symbolizing transformation to a new life. 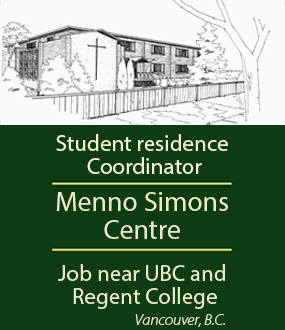 Menno Place chaplain Ingrid Schultz says that fellow residents would ask about their neighbour who had died, as they missed seeing the person at meals and other activities. They had no chance to say goodbye. Several years ago, Schultz’s colleague, Ruth Neufeld, whose father had recently died in hospice care, gave her the idea for a butterfly quilt. 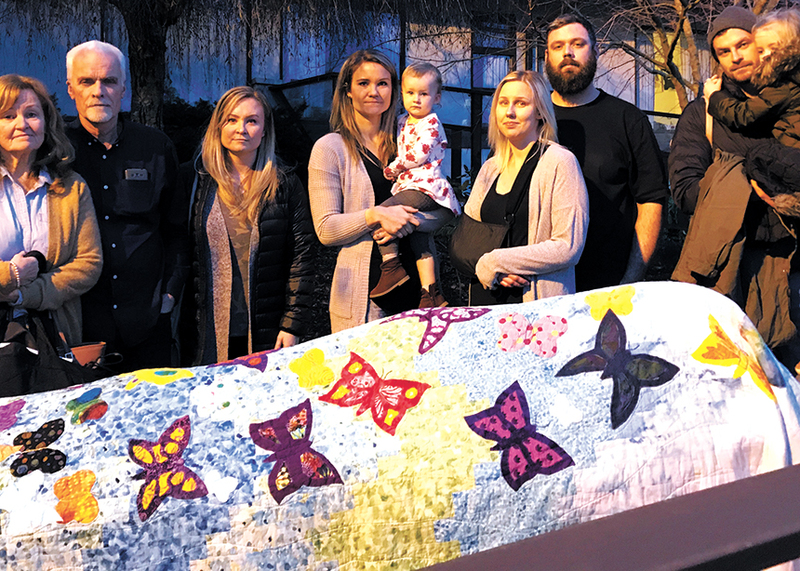 The hospice had the practice of saying farewell to the deceased with a butterfly quilt covering the gurney, and Neufeld had been touched when staff and family together accompanied her father on his final journey out the door. “This seemed like a lovely way to honour someone who had died, and for staff and residents to show support to the family,” Schultz says. Schultz and Neufeld began planning how they could implement something similar at Menno Place. They got permission from the hospice to use the idea, and then, when Menno Place chief executive officer Karen Baillie visited a care home in Eastern Canada and saw the success of a similar butterfly quilt there, the idea took off. “Butterflies represent transition and new life, and in the case of the butterfly passing quilt they represent passing from earthly life to eternal life,” explains Schultz. Meanwhile, several women from a fellowship group at Emmanuel Mennonite Church in Abbotsford, where Schultz is a member, had decided to meet weekly to quilt together. Dubbing themselves the “Menopositives,” they first made quilts for two women in their group who were undergoing cancer treatments. They later made quilts for missions projects. In early 2016, Schultz approached the Menopositives about fashioning a quilt for the Menno Place project, and they readily agreed. Menopositives coordinator Lenora Zacharias designed a pattern using the butterfly symbol as explained by Schultz. “We worked with that as a group and settled on the concept of the curved flight of butterflies moving from the darker blue tones at the bottom up into the lightest tones at the top of the quilt, with lots of colourful butterflies that were created by the ladies in the group,” says Zacharias. The group worked hard to finish the quilt in time for Menno Place’s annual memorial service in June 2016, honouring those residents who had passed away during the previous year. The quilt was dedicated at the memorial service, which some of the Menopositives attended, followed by the annual butterfly release celebration in Menno Place’s courtyard. Schultz reports that the quilt has been used many times since its dedication and is much appreciated by families and Menno Place staff. Instead of rushing a resident’s body out of the building, staff now coordinate a “passing quilt processional” befitting and honouring the person’s life. After one of the chaplains has offered a prayer of release for the resident now entrusted to God’s hands, the quilt is placed over the gurney in the resident’s room. As the body is placed in the funeral home’s hearse, the quilt is removed and reverently folded up. 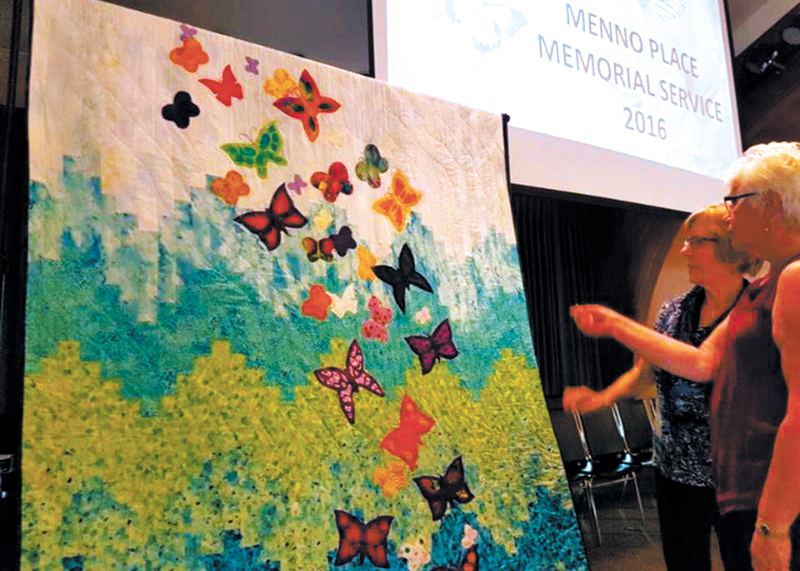 Because of the large number of deaths at Menno Place—last year there were 160—a second quilt has been added, so that both Menno Hospital and Menno Home have easy access to one. Hilde Wiebe, retiring executive director of Menno Place Care Services, made the second quilt as a gift to Menno Place, piecing it together with the quilting by the Menopositives. What a beautiful way to ease this transition! It reclaims death as a natural part of life, removes our need to "hide" death, and comforts families by affirming that death is a transition into new life. Thank you for this! Such an inspirational story of great people taking action to bring peace and joy into the lives of the grieving family, while honouring the newly deceased person. Death isn’t shameful, yet we often treat it as if it were. This is a beautiful story. I saw the article called "'Passing quilt' gives dignity in death" and I love the quilt. I am involved in creating a dignity quilt for Bruyère in Orléans, Ont. for their residents when they leave the building. I understand that Hilde Wiebe created the quilt. Is it possible to get the dimensions of this quilt as well as an email address for Hilde? That would be great. I look forward hearing from you. 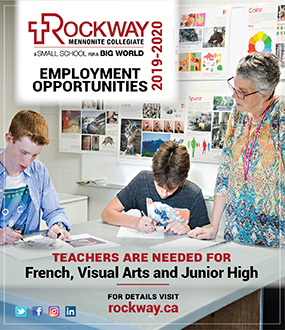 I encourage you to send an email to our B.C. 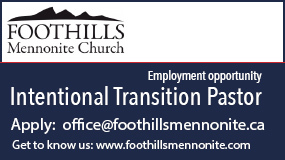 correspondent, Amy Dueckman (her address is bc@canadianmennonite.org). She can put you in touch with Hilde Wiebe.